Leading stroke experts look back at the research advances over the last 15 years in diagnosis and treatment — from the emergence of novel anticoagulants to thrombectomy and the growth of telemedicine. By 2001, several clinical studies testing acute stroke treatments had failed to show efficacy, and there was a strong push to prevent secondary stroke. By then, it was already established that aspirin and other antiplatelet drugs play an important role in the secondary prevention of ischemic stroke. But stroke specialists were divided about which agents work best: Was warfarin more effective than aspirin in preventing stroke after an initial stroke? Indeed, in the years since that first report, the discussion has broadened greatly beyond warfarin and aspirin. Since then, several other novel oral anticoagulants (NOACs) have been reported as alternative treatments for stroke prevention, particularly in patients with atrial fibrillation who are at high risk for cardioembolism, said Ralph L. Sacco MD, FAAN, president-elect of the AAN and the Olemberg chair of neurology and executive director of the McKnight Brain Institute at the University of Miami in Florida. To date, four NOACs have been approved for primary and secondary prevention of stroke in patients with atrial fibrillation: dabigatran (a direct thrombin inhibitor), rivaroxaban, apixaban, and endoxaban (direct Factor Xa inhibitors). Tissue plasminogen activator (tPA), federally approved by the Food and Drug Administration (FDA) in 1996, and the more recent development of endovascular treatments like thrombectomy, have been the most dramatic change in stoke care over the last 25 years, said Kevin N. Sheth, MD, FAAN, associate professor of neurology and neurosurgery and division chief of neurocritical care and emergency neurology at Yale University School of Medicine, New Haven. “tPA was the first and only drug approved for treating stroke, and it changed stroke care in neurology in many ways. It was the first time we had a therapy for stroke that could reduce the possibility of lasting problems in such patients,” said Dr. Sheth. Importantly, he noted, subsequent studies have demonstrated that the initial three-hour treatment window for tPA can be expanded to 4.5 hours, and some studies, primarily in Europe, suggest that this window might be even be longer, he told Neurology Today. “Emergency department [ED] nonbelievers have increasingly become believers, and this has given rise to entire new systems of stroke care,” he said. “Indeed, the entire stroke care infrastructure has changed dramatically over the last 15 years, largely as the result of the adoption of tPA,” said James Grotta, MD, FAAN, director of stroke research and the mobile stroke program at Memorial Hermann Hospital in Houston, Texas. “The establishment of stroke centers and creation of benchmarks for quality improvement in delivering tPA by our EDs has changed stroke care in most hospitals,” he said. In Texas, he said, one year after telemedicine was established at three or four centers, more than 800,000 additional patients have had access to an ED capable of providing expertly guided stroke treatment, which is especially important because so many patients in Texas live in more rural areas. Mobile units are also changing the delivery of care and leading to more patients having access to earlier treatment in the throes of a stroke, he said. “These units use telemedicine to provide on-board stroke expertise to interpret the CT scan and oversee administration of tPA and other stroke therapies in the pre-hospital stage much faster than is possible when patients had to arrive at an ED,” said Dr. Grotta. Perhaps the most recent game changer in the stroke world is the development and use of stent retrievers, Dr. Sheth said, noting that the initial few trials had disappointing results. Since then, he said, newer devices were designed, and subsequent studies were cut short when efficacy was clearly demonstrated. There are now several FDA-approved devices, and virtually all stroke centers offer endovascular treatments for acute stroke. In 2012, the FDA approved the Trevo Pro Retriever (Stryker Corp) and later that year, two other devices were approved — the Penumbra System (Penumbra Inc.) and the Solitaire FR Revascularization Device (Covidien). “Like tPA, the sooner we use stent retrievers the better,” said Dr. Sacco. Patients can benefit up to six hours after the initial event, and studies are now underway to see whether the window can be extended. “Now we have multiple approaches and more studies of other options are underway,” added Dr. Sheth. This has not been a small effort, he added, but one that has evolved into multiple research efforts, with considerable support from the National Institutes of Health and a lot of funding from pharmaceutical and device manufacturers. “The pace of these [and other changes] is accelerating, and it has been wonderful to have witnessed this evolution,” especially given emerging evidence that vascular disease is much more prevalent than previously thought, said Vladimir Hachinski, MD, FAAN, distinguished professor of neurology and epidemiology and chairman of clinical neurological sciences at the University of Western Ontario's John P. Roberts Research Institute, in London, Ontario. Newer prevention and treatment strategies have helped reduce stroke and dementia incidence and deaths after transient ischemic attacks by 26 percent, he said. This article on stroke is part of a continuing series, “Fifteen Years of Publication: Then and Now” that looks back and ahead at some of the early research advances on brain repair first reported in 2001, the inaugural publication year of Neurology Today. •. Mohr J, Thompson J, Lazar R, et alfor the Warfarin–Aspirin Recurrent Stroke Study Group. A comparison of warfarin and aspirin for the prevention of recurrent ischemic stroke http://www.nejm.org/doi/full/10.1056/NEJMoa011258. N Engl J Med 2001; 345:1444–1451. •. Sacco RL, Prabhakaran S., Thompson J, et al Comparison of warfarin versus aspirin for the prevention of recurrent stroke or death: subgroup analyses from the Warfarin-Aspirin Recurrent Stroke Study http://www.karger.com/Article/Abstract/92331. Cerebrovasc Dis 2006; 22:4–12. •. Goyal M, Demchuk A, Menon B, et alon behalf of the ESCAPE Trial investigators. Randomized assessment of rapid endovascular treatment of ischemic stroke http://www.nejm.org/doi/full/10.1056/NEJMoa1414905. N Engl J Med 2015; 372:1019–1030. •. Fransen P, Beumer D, Lingsma H, et alfor the MR CLEAN investigators. Time to reperfusion and treatment effect for acute ischemic stroke: A randomized clinical trial http://archneur.jamanetwork.com/article.aspx?articleid=2478306. JAMA Neurol 2016; 73:190–196. •. Saver J, Jahan R, Levy E, et al SOLITAIRE™ with the intention for thrombectomy (SWIFT) trial: design of a randomized, controlled, multicenter study comparing the SOLITAIRE™ Flow Restoration device and the MERCI Retriever in acute ischemic stroke http://onlinelibrary.wiley.com/doi/10.1111/j.1747-4949.2012.00856.x/abstract. Int J Stroke 2014; 9:658–668. 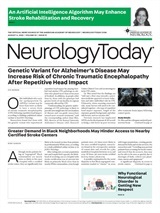 Neurology Today16(12):11-12, June 23, 2016. Diabetes Mellitus, Generalized Weakness, Swallowing Difficulties: Solve this Case! Stem Cells Created Without Human Embryos — What Does it Mean for Embryonic Stem-Cell Research?